Earlier this month the Centerville (OH) Grace Brethren Church dedicated and made available to its community a lovely park including a two-acre lake, a 30-foot gazebo, and an open recreation area with a walking trail around the lake. Pastor Steve Makofka (pictured) led the dedication ceremony and gave a short message. According to Makofka, making the church-owned park available to the community will greatly help identify the church to the local citizenry. Already there has been one wedding at the gazebo with another scheduled for the fall, and the gazebo has served as a rest stop for a multiple sclerosis Bike-a-thon. Families from the community are beginning to use the park for family pictures and reunions. The project began, says Makofka, when a developer bought the 600-acre farm that surrounded the church and its 17-acre campus. The church sought to work with the developer to create a park-like environment. At first they envisioned a large cross statue by the lake to be used as a spiritual meditation point, but the developer felt that a gazebo might find wider use instead. A local couple, David and Jeanne Rebele, had talked with Makofka about the possibility of giving a gift to the church, and when he suggested the gazebo to them, they were thrilled. “It was exactly the kind of project they were looking for,” Makofka says. 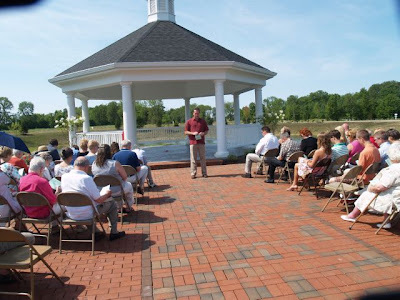 So the Rebeles provided the finances for the gazebo and the memorial plaza, which is a brick area in front of the gazebo containing the names of charter members of the Centerville church with room reserved for other memorials and commemorations. Makofka says the lake, park, and gazebo are getting good use by the community. Currently the local high school girls’ lacrosse team uses it for practice. Makofka says, “Almost any day of the week I can look out from the church and see people walking their pets, riding bikes, or fishing.” Including some undeveloped wooded areas, the park is about 10 acres. To see a slideshow of the dedication of the park click here.